Periorbital edema, or eye puffiness, is the medical condition where the tissues surrounding the eye become swollen. This is primarily due to an inflammatory process that results in fluid buildup around the eyes (called the orbits). The process of swelling around the eye can happen suddenly (acute) or develop over an extended period of time (chronic) due to aging and other pre-existing medical problems. There are various causes for both acute and chronic types of periorbital edema, such as infection or a long-term condition like kidney disease. Mononucleosis: Also know as the “kissing disease” in the younger population. This viral disease is commonly spread through saliva. Periorbital edema can be a symptom in the initial phases of the infection. Lack of sleep or sleeping too much: Sleep deprivation or even excessive amounts of sleep can result in the appearance of puffy eyes. Fluid retention: Problems excreting excess fluid can result in fluid buildup in other parts of the body, including the orbits of the eye. Diet: Eating meals with excessive salt content may lead to fluid retention in subcutaneous tissues, causing eye puffiness. By modifying the diet to limit salt content and incorporating regular exercise, excess salt can be removed from the body. Drinking high quantities of alcohol: Dehydration is a common side effect of excessive alcohol consumption. This may result in the body trying to hold onto as much fluid as physically possible, manifesting as periorbital edema. Smoking: Of the many negative effects that smoking has on a person’s health, it can also cause hormonal imbalances, leading to fluid retention and subsequently puffy eyes. 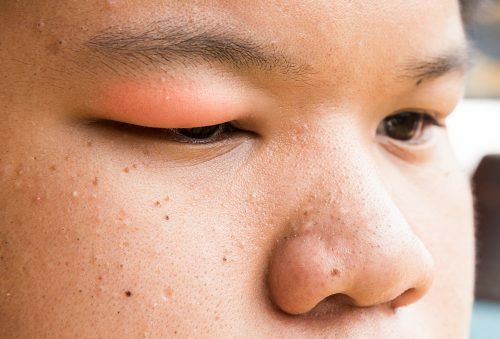 Allergies: Acute allergic reactions due to allergens, including pollen, animal hair, or chemical substances, can lead to inflammation of the small blood vessels (capillaries) of the subcutaneous tissue around the eye, presenting as periorbital edema. Skin disorders: Individuals suffering from dermatitis may experience periorbital edema, especially women. Aging: The aging process naturally causes the body to lose more water, which can lead to increased fluid retention and the appearance of mild forms of periorbital edema. Crying: Can cause temporary periorbital edema. Thyroid disorders: Facial swelling and periorbital edema are possible symptoms of hypothyroidism and hyperthyroidism. Periorbital cellulitis: A serious condition caused by inflammation and infection of the eyelid and portions of the skin around the eye presenting as periorbital edema. This condition often requires emergency treatment if symptoms persist beyond two to three days. Chagas disease: Also known as American trypanosomiasis, it is an infection due a tropical parasitic disease transmitted through insects called kissing bugs or triatomines. This condition may result in periorbital edema that affects only one side of the body without pain, despite severe inflammation. Nephrotic syndrome: Results in the retention of bodily fluid due to abnormally functioning kidneys. This can result in the tissue around the eyes becoming puffy. Trichinosis: A condition caused by the consumption of raw or insufficiently cooked pork meat infected by a particular type of roundworm. Tear glands: Dysfunctional tear glands may result in periorbital edema. Obstruction of the superior vena cava: Due to the engorgement of blood in all the structures above the superior vena cava of the heart, periorbital edema may be seen alongside symptoms such as difficulty swallowing and shortness of breath. Mild to severe inflammation around the orbit of the eye. Impaired vision that may occur due to severe cases of inflammation. It may present as blurry or double vision. Vision may be obstructed by increased eye puffiness. Redness may accompany inflammation of the eye orbit. Proptosis or bulging of the eyeball may occur. Chemosis or inflammation of the eye sclera (white portion of the eye) may be present. Eyelid retraction with the eyes appearing wide open due to excessive inflammation preventing eyelid closure. Periorbital edema caused by severe allergic reaction may present with life-threatening symptoms that require medical attention to secure airways and prevent vascular shock. Cases of acute infection may also present with systemic symptoms, including fever, general malaise, nausea, and vomiting. Lymph node tenderness may also be present. Corticosteroids: Can be used topically or orally to aid in reducing the body’s overall inflammatory response and subsequent reduction of eye swelling, improving symptoms. What causes mucus in eye (eye discharge) and how to get rid of it?